When will you be ready to grade for your "Kuro Obi" (Black Belt), after 3 years, 4 years, 5 years...? At this weekends Black and Brown belt training Campbell Sensei gave some clear direction, he was talking about Jiyu Ippon Kumite and said you are ready when you can take the Black Belt from your training partner. In the cult TV series Kwai Chung Caine would not be ready to leave the temple until he could take the pebble from Master Can's hand, you must step up to the mark and take that Black Belt. It does not just apply to Jiyu Ippon Kumite. What do Gohon Kumite, Sandon Kumite, Kihon Ippon Kumite, Jiyu Ippon Kumite and Jiyu Kumite have in common? The word Kumite, all should be performed with the same budo spirit. As A Brown Belt you should be a dangerous and hungry opponent for any Black Black. Sensei Simon from Haxby was particularly good at this (and still is, but don't let him know). It does wonders to raise the game of Black Belts to have a hungry Brown Belt trying to take your Black Belt away. Jim reminded me at the weekend of the particularly enjoyable Jiyu Ippon Kumite session with Simon for I think his 2nd or 1st Kyu grading. I can say that we both really went for it, which came as a bit of a surprise for the parents of the junior grades who wondered what the hell was going on. Simon thought he had completed his block and counter at one point, he did not move away so with out thinking Ashi Bari, gyaku zuki. I think it got a bit scrappy at times, but it was definitely budo. 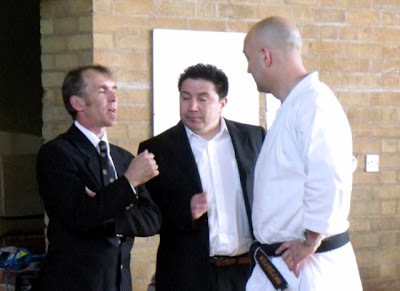 As Campbell Sensei said you will not be given a Black Belt, you need to take it. Not everyone will want it enough, young Tom Smith from Haxby has got a lot to teach our Brown Belts. From the second he lined up for his Shodan grading in front of the JKS chief instructor Kagawa Sensei he was TAKING a black belt home, there was no doubt in his mind at all. When you can follow Tom's example, you will be ready and if you are not ready, do not step on the line and present yourself for grading. We all know that the principles of the dojo (the dojo kun) should also be practiced outside the dojo, but are external principles able to be applied inside the dojo? I am regularly responsible for the conduction of ranges, for soldiers who are attempting to pass an annual weapons test. If they have paid attention to their weapons lessons and apply the marksmanship principles it is like doing a yellow belt grading every year. If you can't maintain this minimum standard, you can not remain. Unfortunately many do not find it easy and fail to meet this minimum standard,why? My 1st question to those that do not pass is "Did you apply the marksmanship principles? "; the answer is always "Yes". My 2nd question is "What are the principles? ", this is usually followed by a period of silence or waffle. If you do not know the core principles behind what you are trying to perfect how on earth can you apply them and ultimately achieve the level of success that you desire? Surprising the 4 marksmanship principles translate very well into kata. 1. You must have a solid stance from which to perform techniques. 2. The weapon must point naturally at the target without any undue physical effort. 2. The technique must naturally follow the correct path. 3. Joint alignment (Knee, hip, shoulder, elbow, hand etc) must be correct. 4. The shot must be released and followed through without undue disturbance of the position. 4. Your technique must be executed without undue disturbance of your stance. The other Wednesday I still had this concept of keeping core principles in mind when I asked a group of Brown and Black belts what the core principles of kata were. I was met with a similar puzzled expression to the soldier on the range. They did manage to list quite a few important points, but not "principles" (general rules). I asked them to go and see what they could find out, pointing them towards Nakayama Sensei's Best Karate series. 1. The correct number and order of moves must be performed. 2. The kata must begin and end at the same spot. 3. The meaning of each movement must be clearly understood and fully expressed. 4. The karateka must be aware of the target and know precisely when to execute the technique. 5. The rhythm and timing must be appropriate to the kata. 6. Breath properly and kiai in the correct places. During your kata practice you may wish to select one or two principles to focus on, but those who are preparing for Brown and Black belt gradings need to consider all these key principles when you present yourself for examination. Knowing what the core principles of kata are has got to help, Osu! A big thank you to everyone that supported the SSKC Competition . The Cups have been engraved and I dropped Haxby Clubs off on Thursday, York your cups will be delivered Monday and I will bring the Seibukan Cups down to B & B trg in a couple of weeks. I have completed the accounts for the event and have prepared a cheque for £250, which I hope will kick start the JKS England Squad fund. Good luck to all the team in Dublin this weekend, Osu! A link to the Wa Shin Kan dojo can be found in our links section, just click "Links" in the sidebar. There was a great turn out for 2011 with sixty competitors in all. A time for karateka from our local (and not so local) clubs to experience competition in a semi formal atmosphere and use the experience as a stepping stone to national and international events. Above : Sensei Steve, Luis and Andy all old SSKC members. Luis and Andy reflect back on the times when Sensei Steve used to "beast" them up and down the dojo in the early 1980's. Below are the results of yesterdays competition with some short clips and photos. Many congratulations to all the Cup and medals winners and all karateka for supporting the event. "The Gough & Kelly Cup"